Lemon Velvet Cake. Our most popular cake to date, for its real lemon flavour and incredible light, airy texture, while still staying moist and delicious. Before this Lemon Velvet Cake, it all started with me trying to develop the best Red Velvet Cake recipe I could. It was such a success and I loved the moist, tender texture of that cake so much that I just had to try a White Velvet Cake and then an Orange Velvet Cake. Those turned out to be a couple of the most popular cake recipes ever on Rock Recipes so I couldn’t stop there. Keeping the lemon lovers like me in mind, a luscious lemon version was inevitable. The creamy, tangy lemon buttercream frosting goes particularly well with this beautiful lemon cake too. 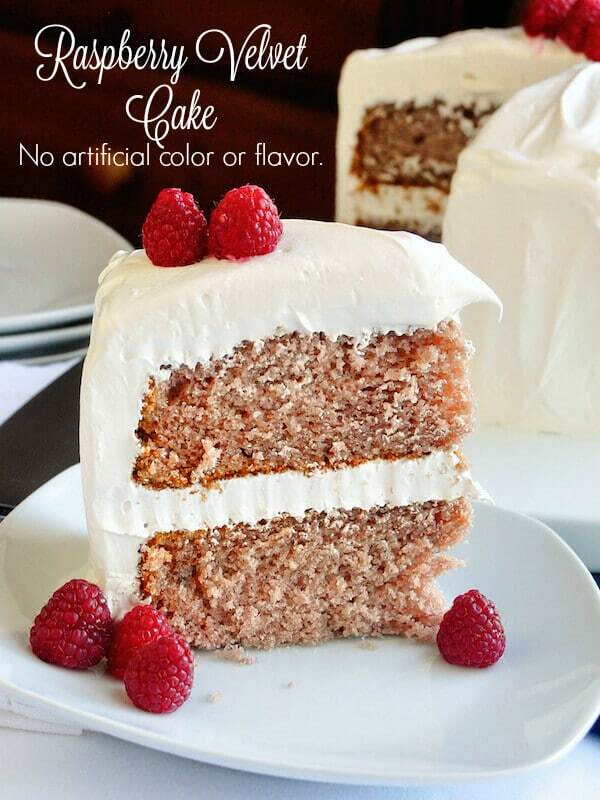 Update: That pink version is now posted as Raspberry Velvet Cake! Like this Lemon Velvet Cake recipe? Find dozens of other amazing homemade cake recipes in our Cakes and Pies Category. 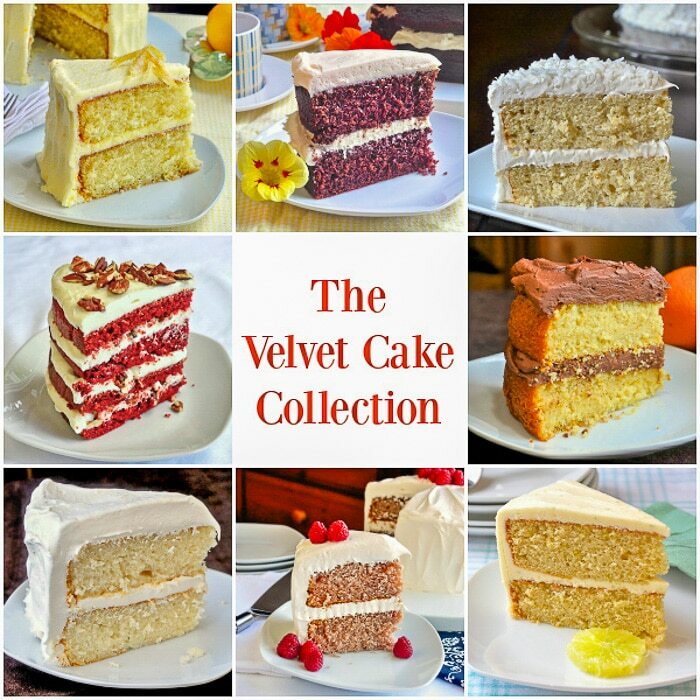 Be sure to check out all of the other recipes in the Velvet Cake Collection too! I generally bake this cake in round 8 inch pans or 9 inch Aluminum Cake Pans but the recipe can also be made as a sheet cake in a 9 x 13 baking pan . I’ve found that the 9 inch pans may bake up a little quicker so be sure to check it 5 minutes early. Depending on whether you use glass or not, the 9×13 size could take a few minutes longer. Just let the toothpick test be the final judge. Lemon Velvet Cake as a birthday cake, anniversary cake or wedding cake. 2018 update: Since this recipe was first developed several years ago, I have heard from countless people who have made this cake for every possible occasion from an Easter Cake to a Mother’s Day Cake. 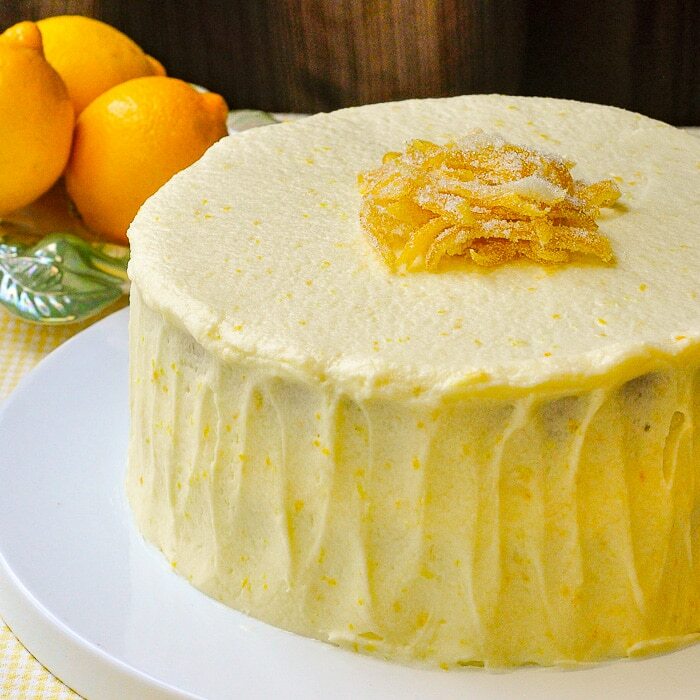 Wherever you find lemon lovers, this cake is sure to to be a hit. One word of caution about fondant and wedding cakes though. This is a very light textured cake, so if using fondant icing on a celebration cake be sure to use the thinnest layer you can. Minimal stacking is also recommended unless you are using a weight supported stand. Too much weight can compress the light airy crumb structure of this cake. 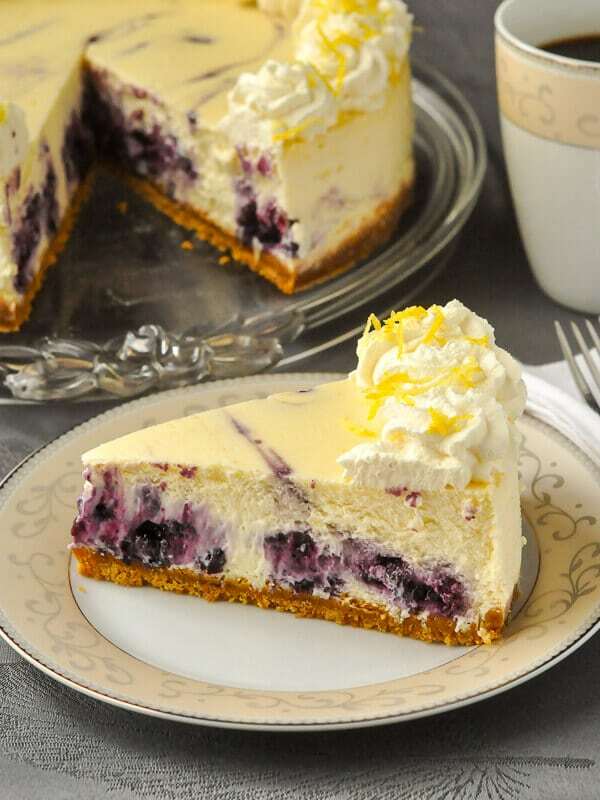 You might also like our recipe for Lemon Blueberry Swirl Cheesecake. Developed from an outstanding Red Velvet Cake recipe, this lemon cake is a perfectly moist and tender crumbed cake with a lemony buttercream frosting. An ideal birthday cake for the lemon lover in your life. Previous versions of this recipe have included twice the amount of frosting. In this recent update I've halved that to provide enough frosting for the middle and top as many people seem to prefer. If you want to frost the entire sides of the cake as well. please feel free to make one and a half or even two times the recipe. It depends on how much frosting is your personal preference. I made the lemon velvet and it stuck to the pan. It did not say in the recipe to grease the 9″ cake pans but I did anyway. Do you think that is why it stuck? The cake is very moist and tasty. I would like to make again, but not sure what I did wrong. The FIRST instruction says to grease and flour 2 nine inch pans. There are online convertors to help with this. I dry cup = 8 ounces, or 250ml. Grease the two pans with shortening. Then use a piece of round cut parchment paper on the bottom. If you grease the entire pan well with the parchment the cakes will come out a lot easier. When in doubt, it’s a good rule of thumb to grease your pans and line the bottoms with parchment paper. You will never go wrong with that. I have tried this cake and it is delicious! Since I have never found a strawberry cake that I like, I was thinking about trying to make this strawberry. Have you ever tried this? Maybe put in vanilla where it calls for lemon extract and strawberries in place of the lemon zest? Get frozen strawberries. Thaw and strain to remove all liquid. You may press them thru a stainer. Add strawberries to cake. You can usr the liquid to flavor your icing. It says 11st grease & flour pan. I spoon flour into the proper sized measure, level the top with the back of a knife. I sift after measuring most times. Sorry, It should have read grease and flour the pans. I always add a circle of parchment paper to the bottom of the pans as well. I’ve made the instruction more clear at the beginning of the recipe. Glad you liked it. Why do you have to use parchment paper if you’re greasing and flouring the pan? curious…. Usually at least in the bottom for easy release. Yep easy release – I watched a baking competition and these bakers were asked to bake a cake. All of the bakers but one baker – greased, floured and used parchment paper – the aprchment paper was greased as well. The one baker decided not ot use the parchment paper – he said he was in a hurry – his result – when he attempted to release the cake it stuck. 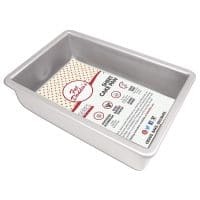 Instead of using two 9 inch round pans – how about a 9 x 13 inch cake pan. I wonder what the baking time – I plan on making this recipe for my husbands bday. I may have to do some research for the answer. Thank you so much Barry for sharing your recipe! A 9×13 should be fine. Might be a bit longer baking. Rely on the toothpick test for best results. I made this and it was delicious. I did cut the butter and powdered sugar in the icing recipe in half. It just seemed nuts to use a whole pound of butter for a 2 layer. Still worked great. CAN I USE ALL SWEET BUTTER IN PLACE OF THE OIL? No that will affect the unique texture of this cake. This cake is amazing!!!! It was very easy to make and I didn’t have any problems with it. It stays moist and fresh for several days. Have you ever played around with a dark chocolate cake? I was wondering if I could use your white velvet cake and add melted dark chocolate baking squares? An experimental chocolate version using cocoa is in the oven this morning. Stay tuned! I’d say the color will vary naturally as it does with the color of the lemons. I used a few drops of yellow food coloring.My cake was yellow as a lemon! Just wonderful!!! Barry, I think your answer should’ve read: The darker your egg yolks, the more yellow your cake. I’m not a baker but want to try this cake. Do you measure the flours before sifting, or sift them first to yield 1 1/2 cups each? Sift then measure if the flour is not presifted. For presifted flour I measure, then sift to make sure it is well aerated. I’m thoroughly confused. .. I could swear in a different review you said to use cups and not pack the flour but measure before sifting. Now in this review you say sift then measure. when do u do it one way and / or the other? And what’s your technique plz for sifting then measuring ? That seems awkward and many dirty bowls..lol or it’s probably just me. Is that a typo or does it call for 1 full cup of vegetable oil? It is listed twice! I made this cake last night and it was PERFECT. Absolutely perfect. I used parchment circles to line the bottom of my cake pans and the cakes popped right out. THe only thing I did differently was made a lemon cream cheese frosting instead of buttercream. Thank you! Do you happen to have the lemon cream cheese recipe on the website? I’m gonna check right now since I have a block or cream cheese in my fridge waiting to be used sometime. I’d just add regular cream cheese icing and add a little finely minced lemon zest to it. That’s fantasic. This recipe really has taken off in popularity. Read it again Sibyl, you are misreading. It uses part oil & part shortening. I really want to try out this recipe for all the rave reviews but can I use another substitute for shortening? Many thanks. Try it with butter instead of shortening. Can I just use butter alone, instead of the oil & shortening? You ca but I find the shortening does contribute to a softer cake texture. ,I agree Barry , not only does it yield a lighter texture it also makes the cake super moist. I find no fault in this recipe. I would like to know how to get my layers to come out the way the picture shows of this cake. Everytime I make layers the. Always has a hump in the ;middle. Is there a trick or method to this besides cutting the top of the layer. Please help! I find thicker batters are the ones that tend to dome. I don’t really have that issue with this recipe but I will slice the tops off the dome if I feel it’s necessary on any cake recipe. May I substitute Hi Ratio shortening instead of butter in the frosting? I live in Tx and have a wedding cake request for this cake. I’ve used vegetable shortening in a similar recipe but I don’t know what high ratio shortening is. I’d do a small test batch if I planned on using it on a wedding cake. I’m not a cake decorator, I’m afraid. Is it normal for the cake to not rise very much? For baking your soda powder and baking powder need to be fresh. I write on the can the date of purchase and make sure it’s less than a year old. This makes a difference in rising. The baking soda I use a lot of but the powder I find needs replacing before I use it all but I’m not a big baker and live alone thus low usage. I hope this helps someone. I haven’t had a problem with this cake rising. First time someone has mentioned that so no, I would say it is unusual. My cake did not raise much either, maybe it was the freshness of the powders, not sure. Vi followed the recipe very carefully. It’s still cooling so I don’t know how it tastes yet. I also halved the frosting, but that takes great . Is this cake firm enough to hold the weight of another tier? What about fondant? I’d say no. It is very light and not dense. I’d definitely use plates and dowels for a decorated cake. Have you used this recipe be used to make cupcakes? If so, what was the yield and baking time, approximately, since everyone’s ovens are different? Thanks! I haven’t used it to make cupcakes but it’s worth a try. Everyone’s oven is different and the smaller the item the bigger the impact of baking them too long. My oven takes about 15 minutes but watch them closely and use the toothpick test to be sure. I always write baking times for my oven on the page if they vary from the recipe I’m using. That way you’ll be ahead of the game and won’t be guessing next time you bake anything. This looks great! I recently bough lemon infused cooking oil. The instructions on the oil say to use in place of butter. Seeing as there’s butter AND oil in this recipe, should i just use my infused oil in place of butter, and leave out the oil? I’d try using it in place of the oil. You need a combination of liquid and solid fats for this recipe to work. Hi Barry, thanks for sharing this recipe. Can the cakes be made a couple days in advance of serving? If yes, how should they be stored? Thank you! Sure. I store ours in a plastic cake dome container. Most flour I buy is presifted. If unsifted, I sift and measure, if presifted, I measure and sift. I also made cupcakes and mine took 22 minutes. I thought they were a little muffin-y, maybe I shouldn’t have cooked them so long. I’m going to have to try them as cupcakes. Ovens vary but mine wouldn’t take 22 minutes I don’t think. What’s the purpose of using vegetable oil and vegetable shortening in this recipe. I made this recipe into cupcakes and it was full of flavor ( I did use juice from half of the lemon as well as the zest) and it was delicious. Moist, light and full of lemon flavor. I will make this again! I have made this cake twice in 1 week. It is very good. The 2nd time, I added more lemon zest in the icing and also the juice of a whole small lemon. It made the icing have a little more tartness and it tasted much better the 2nd time. I thought the cake itself was very crumbly, so the 2nd time, I put a dollop of sour cream or 2 in the batter. I baked this cake last weekend. The only addition I made was to squeeze some fresh lemon juice in the frosting. It was really wonderful. I’m making it again today for someone’s birthday. Oh, I did cut the frosting in half for a 2 layer cake. Delicious! The cake was tender in texture and flavourful. I did substitute the lemon extract with a lemon baking emulsion though. I multiplied the recipe 1.5 times and got two 2″ high 8″ rounds. The cake held up well to being covered in ganache and fondant. I’m looking forward to trying to stack cakes with this recipe, and the other variations. I made this cake yesterday and it was a hit !! Very moist cake and tasty. Thanks for sharing…. Omg….This cake was awesome. I baked it twice in one week. Do you actually “fold” ( by hand) in your ingredients? I have only done this with egg whites . Yes Folding by hand is best but if you have a paddle attachment on your mixer you could possibly do it on low speed. Folding – When I fold ingredients into batter I don’t use a paddle attachment. I use a wooden spaon and very gently stir. You can look online like Youtube and it will show you how to fold. Hope this helps! Thank you for sharing this lovely cake recipe!! I am making my second one into cupcakes. The first cake was a huge hit. Have followed the recipe as written ’cause it works so well. Could this be made with gluten-free flour? They do not have a cake flour . I’m afraid I can’t speak to that, I’ve never tried it but if you do try it, please let us know the results. Barry. I made it with gluten free flour (the pillsbury and great value versions). For the cake flour, I followed an online recipe about putting 1 tbsp cornstarch in a 1/2 cup and filling the rest of the 1/2 cup with gluten free flour. The cake turned out soft, fluffy, and delicious! Is parchment paper needed? Or can I just grease and flour? Not necessary. I just like to line the bottoms at least for easy release from the pan. All my lemon blueberry recipes use either butter or shortening I think. Is there a reason you just wanted an oil based recipe? I’m planning on making this for a birthday this week. Is it easy to pipe/decorate with the buttercream? It pipes well but you may want to omit the minced zest if using very small tips. I can’t comment on cake mixes or pudding mix recipes. I never use mixes, I always bake strictly from scratch. I think You’d find that he mixture of shortening and oil in this cake will not dry out. One of the things people comment on about this recipe is that it stays moist for a few days. You might want to try it with blueberries. thank you so much Barry , i will try your recipe and see how it works , i am sure i will love it , thank you for your time , have a good day . Good luck. I may try a quick recipe of my own soon using just oil. Stay tuned. Barry I made this cake and it was delicious. I have looking for a moist delicious lemon cake and now I’m set. This is by far the best lemon cake I have ever made. Thank you for sharing. Soon I’m going to try the red velvet. Hopefully that’s a hit as we’ll. I live in the UK and don’t know what our equivalent of cake flour would be? Any suggestions? We have plain flour which is the general purpose and self-raising flour which could be the same as the cake flour…. ? Hope this helped. Oh…and one more thing….CHETNA TO WIN ON BAKEOFF!! LOL! thanks Barry, I will do some research and let you know how the cake turns out. I purchased some measuring cups last time I visited the states so I should be fine with the quantities. Hi Debby I to live in the U.K.i buy my cake flour on line from international foods. It sells all American products. Can you tell me if you use the the lard in the cake. Not sure I want to use it. Can I use butter thanks. The shortening in the cake contributes to the final soft texture. I’ve never tried all butter. Hello Barry I just want to make sure I’m on the same page, when it saids sift flours, baking soda etc and your saying even the sugar. I never had a recipe to sift the sugar as well. Yup. It’s a method that I developed that helps create a very light, tender crumb to the cake. Good luck. I just made this cake and I followed it to a T but I’m sad to say the cake didn’t rise. I’m a little disappointed. Not sure what went wrong for you but as you can see from the comments, it has been made successfully by many. Maybe it’s worth another try. If the cake didn’t rise I do have an idea what could have happened. If the baking powder is old than that could have been the problem. Absoultely. Old baking powder loses its lift. Hello Barry I did icing the cake and it was delicious. So I’m not sure what happened but I will try it again. I want to know could I just use cake flour. I’ve just tried this recipe and it’s in the oven. I was just wondering why you sift the sugar? I’ve never done this before and it really threw me off… it doesn’t even get through the sieve. Could it just be thrown in after the eggs like most cake recipes? I also have a comment about the way you worded Step 2. You say the word “blend” before mentioning the whisk attachment. I attached the paddle because this is the standard for cakes and realised only once I started mixing the ingredients; it wasn’t a big deal, just a nuisance but could have been avoided with better wording. I also wouldn’t describe the mixture as “light and fluffy”… it really just became homogeneous. Thanks! I’m looking forward to it coming out of the oven! You could just blend the sugar into the sifted flour if the sugar grains are too large, I find a big difference in sugar brands and big differences depending on where you live. Sieves of course, vary as well. 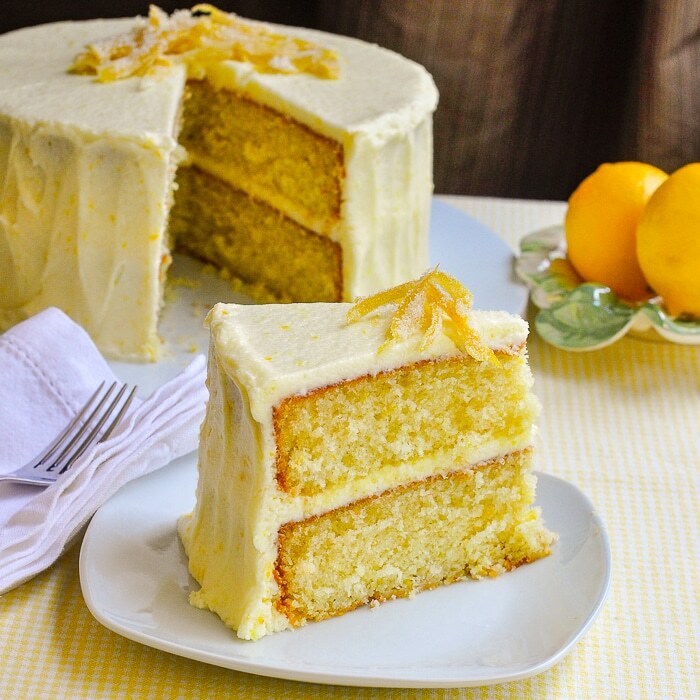 I have made this cake and it was a big hit……perfectly moist, and just the right amount of lemon. I have it posted on my blog “thewednesdaybaker.blogspot.com” I used my new favorite buttercream and used a lemon curd filling in the middle. This is a keeper for sure. Thank you so much. Thanks for sharing your experience. Glad it was such a success and good to hear that it freezes well too. I would love to make this as a three-layer cake, preferably three 9″ layers, but 8″ layers would be fine also. Should I make an extra half recipe? I can’t way to try this recipe! That’s what I would do. Enjoy. Wondering why you use lemon extract as opposed to lemon juice. You could use it for the milk in the frosting if you prefer, the milk gives it a more creamy look. There is enough flavour from the lemon zest if you prefer not to use the extract. I’m just a lemon freak! Can you use milk or yogurt instead of buttermilk, cannot get it anywhere! Add a tsp or 2 of lemon juice or vinegar to regular whole milk as a substitute. It will be just as good. Are you in the UK Ashley? Hi, Barry: I just found your site and really love your recipes. They are really moist and nice. In fact, it is cool that they pretty much have the same ingredients and amounts. Easy to remember. I wanted to let you say thank you and let you know that I live in a mile high city, with altitude of 5300. The measurements work just fine as you have them. The only thing is that I get better results in structure when I add more (75/25) all purpose flour than cake flour. Or if I use all purpose flour alone, I sift it beforehand a bit. I bake at 350 degrees instead of 325 and that works great here. And as you know we bake for longer in the high altitude places, such as it takes about 35-40 minutes. I also have substituted the shortening for the same amount of butter and the cake is so delicious with flavor too. With the all purpose flour mix, I don’t worry about the cake coming out too light or tender to stack. The texture makes it great for stacking cakes. The cakes still come out really nice and moist. Thanks. I sometimes get questions about high altitude baking but Living near the ocean, I don’t really know much about it. I have 2 questions. 1) have you ever tried separating the eggs and folding in the egg whites as the last step? 2) Do you use the whisk attachment on the Kitchen Aid all the way through this recipe? Or, do you change to the paddle attachment at some point? No I have never tried separating the eggs. I don’t think that’s necessary and would affect the texture of the cake. I use the whisk attachment to start but you can switch tot he paddle attachment for the dry ingredients or fold in by hand the final addition of dry ingredients. Thanks for sharing this great recipe. It is very moist and came out perfect! !My husband enjoyed it as his birthday cake. Always happy to be part of someone’s celebration. That is an incredibly popular cake on Rock Recipes. Can we use all purpose for cake flour ? Technically yes, but the unique, soft texture of this cake relies on using part cake flour in the recipe. It will be heavier and denser only using all purpose flour. I AM CONFUSED HOW CAN OIL, SHORTING,LEMON EXTRACT , VAN, CAN BEAT UP (FLUFFY) HAD A PROBLEM WITH THAT? It certainly does for me and many others who have had great success with this recipe. Did you try the recipe or are you just asking? I made this lemon velvet cake yesterday and was disappointed. My cake turned out more dense than I expected based on other reviews. I used unsweetened applesauce in place of oil and butter in place of the shortening. Could these changes have made the difference? Well, yes. You can’t drastically change a cake recipe and expect that will turn out correctly, I’m afraid. The balance of the shortening and oil in this recipe is what gives it it’s unique texture. That link does link back to my site for the recipe but when pinning it’s always better and more efficient to pin the original source. Do any of the ingredients need to be at room temperature or is it okay if they’re cold? I generally use them cold but room temp may help your cake rise better. Has anyone tried coconut oil in place of the shortening? Thank you Barry for the best cake recipe that I have ever made. I rarely leave reviews but this time I had to. For the cake, I followed it exactly except that I omitted the vanilla extract and squeezed some fresh lemon juice into the batter. For the icing, I used 2 sticks of butter and 6 cups of powdered sugar. I used fresh squeezed lemon juice and a little milk (it yielded plenty of frosting for a 9 inch 2 layer cake. The cake baked very high and had a beautiful presentation. The texture was soft and moist but held up in the layers. Yum!!!! That’s terrific. 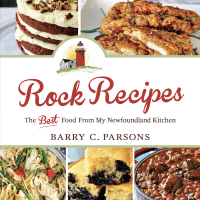 This recipe is much loved by many Rock recipes followers. I am a bit of a novice, when you say that the oil/shortening mixture should be light and fluffy, what exactly should that look like and roughly how long should that take. Mine was light in color and I could see bubbles, but it was runny in texture. Hust search Chocolate Velvet Cake on the website. It’s there and easy to find. This cake was simply delicious! Be sure to read the instructions at least two times and you should not have a problem. Hello! I was wondering if i could bake this cake in a bundt pan? Would I need to change anything? Wanting to make this recipe tonight or tomorrow! It would probably fit in a bundt pan. Hi Barry. Could I make this cake in a 9×13 pan? What would be the cooking time in a 9 x 13 pan? Should be maybe 5 minutes or so more. The toothpick test is always your best guide. Thanks, I got that sorted thanks to your comment. Hi, I have tried the recipe just now and turned out a dense cake. I have followed the recipe and ingredients step by step. The ingredients divided by 2 because I want to try the recipe in small amount first. What are the possible reasons for the cake to be dense? Not sure but that result is definitely not typical. People have great success with this cake. I suspect you mis-measured somewhere along the line when you were halving the ingredients. Easily done, I know. Yes, you can use a 240 ml as 1 cup. It is a large batch of frosting. Make half if you like less frosting. My family are all lemon lovers. There are so many awesome and positive reviews, I’ll definitely be trying this recipe, myself. Was just wondering if it’s possible to bake this recipe in a 9 x 13 pan and if so, at what temperature and how long would it need to bake…. Close to the same baking time at same temperature. Let the toothpick test guide you to be absolutely sure. have you ever tried baking this on a half sheet pan? If that’s a 9×13 baking pan and not cooike sheet pan it should be ok.
Great recipe. I couldn’t get the ingredience in step 2 to fluff up all nice and fluffy, but the cake still came out super awesome. was told I had the best cake this side of the Mississippi River. This cake looks fabulous, thank you! I will be making this for my family and checking out your other velvet cake recipes as well. Reassuring to read other comments regarding the “light and fluffy” question. I wondered if I did something wrong. The oil/shortening/extract never reached that state for me either. Also mine took longer than 35 minutes for 2 8inch cakes at 325. I’m afraid I over compensated and they turned out a bit dry. I usually bake cakes at 350. I think this recipe is worth another try. The flavor is good. Thanks for sharing. Very odd for this cake to be dry. Perhaps you left them in too long. This cake was a smashing success! I tweeked the icing by adding some lemon extract and fresh lemon to it. Thank you so much for this wonderful recipe. Do you have a strawberry version? Glad you liked it. Not sure strawberry would work but there is a raspberry version. I’m thinking of using this cake with your ‘The Ultimate Lemon Cake’ recipe because it looks so much lighter and fluffier. What do you think? I found each of your recipes during separate searches then realized that they were both yours! That would be great too I think. Hello Barry. I am planning on making this cake for an outdoor birthday party. It’s already summer. Do you think it would work well? I am not planning leaving it in the sun but it will likely be warm. Do you think the frosting could suffer? I’d make it the day before and keep it in the fridge overnight to chill completely through. That should give you plenty of time for it to stand up to the warm temperatures. I made this cake over the weekend and it turned out great! as of day 3 it was completly gone and my family want me to make another for the 4th. Now the only thig is the frosting makes way too much and i did have plenty left over so i will be able to cut that part of the recipe. Would you possibly create a peach velvet cake? My mom loves the peach muffins we get at Folks & I would love to make a peach cake for her birthday! Might be tricky to get real peach flavour into a cake. Maybe use a peach filling instead? What is Folks? Is it a restaurant chain? can you make this cake ahead of time and freeze it and how long can you have it in the frezzer ? It probably could be frozen for a couple of weeks. Let me know if you try it. ThIs cake came out fantastic! Everyone loved it. I had a lot of frosting left over so when I make it again, I will reduce the ingredients by half. Thanks for posting. I would love to try this recipe, but I have a soy allergy, so the vegetable oil or shortening won’t work for me. I’m new to the allergy and just getting back into baking. Any alternative suggestions? I don’t know much about allergy friendly cooking. I’d look for soy-free options for both. Absolutely delicious–moist and flavorful. Directions were perfect. I received many raves about this cake. The only things I changed: I used butter instead of shortening (because I didn’t have any shortening) and I halved the frosting recipe. I thought that 8 cups of powdered sugar would make more icing than I needed. I had no shortage frosting the cake with half the recipe. I think using a full recipe of frosting may have looked better, but I’m surrounded by people who frequently pass on any dessert, so I wanted it to look a little less indulgent. Will definitely make this again and again. Thanks for the rave review. It’s in our top ten recipes for a reason! Thank you, Barry! This was one of the best cakes I’ve ever baked. It was light and moist…the frosting was to die for;-) Everyone that tasted it raved about it. I did it exactly as you wrote it except for I used lemon oil in the frosting to give it a stronger lemon flavor. Divine….many thanks…looking forward to trying more of your cakes!!!! I made this cake yesterday for my hubs birthday and it was delicious! This cake is far better than the Famous Lemon Cake from our local “Sweet Surrender Bakery” that Oprah Winfrey has raves about. Better because it remains fluffy and more intense in flavor whereas the famous Sweet Surrender cake becomes firm (I suspect due to a lot of shortening). I am going to tell the world about this cake. I followed the recipe to a T and it came out beautiful. And I did have to make my own cake flour using the flour cornstarch thing and sifting it 5 times which was not a bit troublesome at all. Can’t wait to check out your other recipes! Was glad hubs wanted lemon this year. Hi, could you add strawberries or raspberries to the cake? Or would it mess up the whole recipe? Dangerous. This is quite a delicate cake. This cake is amazing, just loved the taste and texture. This is a keeper and thank you so much!!! Made this cake on Labor Day…huge success…just need to clarify frosting….was the butter to be melted or softened? Hi Barry. I want to try this recipe but I do not use processed white sugar. I bake with raw sugar. As you probably know the crystals are large brown and have a stronger flavor. When I bake butter pound cakes I usually cream the sugar very well until the crystals break down and there is no longer a crunchy texture. In your opinion if I use butter instead of shortening or if I cream the sugar with the shortening would the creaming of the sugar to break it down adversely affect the texture? I’ve never cooked with raw sugar but I think the texture would definitely suffer. Can you break it down in the food processor before use? Do you think cutting this recipe in half would make enough batter for a 5 layer cake made with 6 inch rounds? The layers are less than an inch each. I think this recipe is too tender and soft for a stacked cake. I wonder if anything could be substituted for the eggs in this recipe – flax eggs, perhaps? Or is this a recipe that can’t really be messed with much? I don’t use egg substitutions, sorry. Just made it. It’s a huge hit. I, like many others, halved the frosting recipe. How should this cake be stored? It’s fine out of the fridge for a day or two. I did make this cake and it blew me off. Id been looking for a good lemon cake recipe and this made it. Thank you for this recipe. Keep them coming. My frosting was very thin and runny. What did I do wrong? Too much lemon juice? Or mismeasuring? Never had that issue I’m afraid. Humidity can also effect frosting. I always add very little milk and slowly add to get the consistency I like. It easier than adding more powdered sugar to get it thicker. will this cake hold up to fondant? I want to make a two tier baby shower cake. A bit light textured for fondant I think. grand cake you get is well worth it. I am going to try to add and extra 1/2 ingredients to make a three layer cake Wish me luck. Made this recipe for my best friend’s birthday party. It was a hit. People said it tasted like it came from a bakery. The only issue I had was getting it out of the pan. I should have used parchment. Otherwise it was supper yummy! Plz I love ya cakes them which am about to try, but plz u did not mention where u add the sugar. It is written in the instructions to sift hit together with the flour etc. Don’t usually comment but this is one of the best cake recipes I’ve ever tried. I needed a cake for a special occasion for my son. He’s not that fond of sweets, but will occasionally eat something citrusy like lemon pie. So I thought a lemon cake might please him. It was an enormous hit with the whole family. Even my son had a piece after every supper until it was gone, something he never does. I did substitute lemon curd as a filling and cream cheese frosting as an icing, to keep the sweetness down a bit, and it was still scrumptious. Thanks so much for sharing this wonderful recipe which is now a family favourite. The lemon curd and Cream cheese icing sound like a terrific combination. Might have to try that myself. Does it matter if the buttermilk is regular or light? The cake looks so good! Probably not. I use regular. This was delicious! I made it for Memorial Day weekend and everyone loved it! The biggest compliment was that the lemon flavor was perfect and not over bearing. Because frosting needs to be tweaked according to taste, my teenage son helped me with the frosting (which is a first). We halved the frosting recipe and added some lemon juice to it as well as a total of 5 tablespoons of milk and 2 more tablespoons of unsalted butter to get the right consistency and flavor. I’m definitely going to make this again! Thank you so much for the recipe! Do you have the recipe in metrics please? No. Most people use online convertors for this purpose when needed. The recipe will fit in a 9×13 pan but will poor ably take more time to bake. Let the toothpick test be your guide. Made this for a party tomorrow. The recipe made 24 cupcakes (could have got 28 but didn’t want to dirty another pan). My oven was 17 min. I checked at 12, 15, 17. Didn’t use lemon extract in batter I substituted with zest. I added juice from one and 1/2 lemons to frosting and OMG!!!!!! Decreased milk to 2 TBSP but next time (there will definitely be a next time!) I will do the lemon juice 1st and then milk because could probably used touch less milk. Can’t wait to get everyone’s reaction tomorrow. See post above- Oops I halved the frosting measurements and it was perfect for 24 cupcakes with a little extra so I could like the bowl! OMG just tried this as cupcakes and I”m in love. Am going to pair them with a lime buttercream 🙂 \Have you ever tried this recipe without the lemon and just making it as a vanilla cake. I love the texture. Light and moist but not crumbly. There are several versions of this cake on this site, including a white cake. Can I use butter and coconut oil or avocado oil? I’ve never tried that. This recipe is pretty specific to get the right texture/crumb. Made this for a coworker’s birthday – BIG HIT!!!! How long should it take for the oil/shortening to fluff up? I’m not sure what I did wrong but one hour later it still isn’t fluff in my kichenaid at high speed. Please help!! A few minutes. I can’t believe you whipped it for an hour! is room temperature shortening considered crisco? or are you talking about margarine, oleo? Shortening is vegetable shortening, like Crisco, not margarine. Here’s a suggestion put wax paper or parchment pater in your pan it may help you. Lady that thinks because she floured her pan and that’s why it stuck. Need your help, I’ve made several of your velvet cakes. I love the flavor and texture of your cakes, but found them to be a little to moist. So much so they feel wet to the touch. Also, the don’t rise quite as high as I like. I’ve tried adjusting the baking soda as you suggested in post, and it helped some, but I don’t want to over do it. My cakes rise about 1″ 1/2. Would this be correct height. Really need answer though for the dampness of the cake!!! It could be partially the humidity where you are. I’d try adding a tad more flour and maybe using smaller pans. I often use 8 inch pans to get some height to a cake, especially if I am not frosting the sides. It looks better. Thank you! Well I tried it again. I normally use powdered buttermilk (liquid form is hard to fine in pint sizes). Using the powdered buttermilk, I mix with the flour mixture and add the water required as instructed for the buttermilk. The batter was very thin, so what I did was use 1/4 cup less liquid(water) and added 2 tbsp of flour, still a thin batter, but not as thin. My cake is beautiful and not damp to the touch!!!!! It also has a nice rise to it ( I replaced my baking powder, which may have been a factor)! I have not yet tasted the cake, but sure it is just as delicious. I will let you know!!! This cake turned out great!!! Most and perfect. I have tried so many recipes and this by far is the best. I will try your other recipes soon. Thanks for a great recipe. I have made many cakes and tried many many recipes. This cake turned out great first time I made it. It was moist and delicious and had great lemon flavor. I reduced the amount of the frosting by half and used heavy cream and it was more than what I needed to frost cake and in middle. Excellent. I will be trying your other recipes soon. Thanks for a great recipe. Hi! I tried this recipe a few days ago and absolutely loved it! By any chance do you have the nutritive value to go with it? Can i use lime juice instead of lemon extract? That wouldn’t add much flavour. I am thinking about making this as a wedding cake. Any suggestions on how best to double or triple the recipe for a 3 tiered cake? Definitely use a self supporting stand. This cake will not stack well…too soft. Is it okay to use only All Purpose flour? I can not find in the grocery store anything that just says cake flour. The balance of flours is what gives this cake its softer texture. That will not be the same with all, all-purpose flour. Hi does this freeze well?? I made this cake in 2 6x2inch pans and it rose beautifully!! this is definitely the best lemon cake I have made. Am always testing out new recipes and this is my favourite now. I generally wouldn’t freeze a frosted cake. I’ve never had the need to freeze this one, either. hi made this and the first time was excellent. used 2 6x2inch pans. However made it a second time and it came out very heavy and like pudding! made it exactly the same way as before. what went wrong? I suspect you accidentally left out the baking powder. I’ve never had anyone have that issue and this cake has been made thousands of times by readers. Do these cakes freeze well? Unfrosted ofcourse. I’ve never frozen it so I can’t say. It is a very soft textured cake though so probably not as well as a denser cake. I forgot to ask..can you double or tripple the recipe? If so, how? I’m afraid I don’t quite understand that question. This recipe is now my go-to recipe for lemon cake. The first time I made it, I followed the recipe exactly, and it came out great! My dad loves lemon cake, so this recipe gets a lot of use. It’s not too lemony, but has the perfect amount of zing that you want in a lemon cake. The only thing is I exclude the lemon zest from the frosting (which was optional anyway). I can’t wait to try the other velvet cake recipes. The instructions state to beat the vegetable oil, shortening (I used crisco), vanilla and lemon extract at high speed with the whisk attachment until light and fluffy. I made the recipe twice and the mixture never got light and fluffy either time. I beat the mixture with the whisk attachment on my Kitchen Aid for a good ten minutes on high while watching it continually and waiting for it to become light and fluffy. The mixture was turned into a very creamy liquid. Do you have any idea what I’m doing wrong? Thank you. But did the cake turn out okay both times? This may sound silly, but this recipe looks ideal for my daughters Baptism cake. I am planning on (trying) a 8,6,4 cake or an 8,6 cake. would you no the recipe conversions to do this. half the diameter of a round pan multiplied by itself then multiplied by 3.14 will give you the surface area of any pan. You can do the calculation for the pan size in any original recipe and compare. An 8 inch pan calculates : (4×4)x3.14 = 50.24 square inches. A six inch pan comes out to 28.26 square inches. 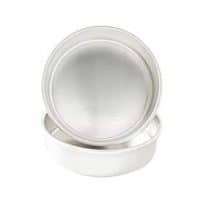 A 4 inch round pan comes out to 12.56 square inches. So a single recipe would fill all those pans. Just made this cake. House smells amazing but I was doing a square 11×13 pan so I can stack and make put fondant over. Definitely need to double the recipe for one pan that big. Can’t wait to taste it though! I’m so glad to have found this recipe again. This is mom and my favorite lemon cake!! I’m making it today for a friend. Can’t wait to cut into it again. I actually put in a little lemon juice in the frosting and cake batter…..and it make it delicious!!! Can you substitute fresh lemon juice (strained) for the lemon extract? Yes but there isnt as much flavour in the juice as the extract. I would not be adding more liquid than the recipe calls for. Barry – We just made this cake for my husbands bday cake. It was delicious, moist and full of flavor! Very lemony – we used a Lemon Cream Cheese Frosting. We were going to add Lemon Curd for the filling but decided to omit it. I made this for my son’s 46th Birthday yesterday and was not disappointed it was light as a feather and delicious. My son said “mum this is so good”, thank you for sharing the recipe. Always happy to be a small part of family celebrations. Great to her it was such a success! I’ve forgotten a simple rule…. Do I measure the dry ingredients FIRST then sift together? or do I sift them into the correct measurements?? BTW, I can’t wait to make this for my friend’s birthday. I personally measure, then sift. I think sifting first can potentially give an under-measurement of flour. I use a set of measuring cups to get the right amount. Spoon the flour into the cup and level with the back of a knife. I never scoop flour because that can compress the flour and cause an over-measurement. Thanks for another delicious recipe. Made it for a co=workers birthday. The lemon flavour was great. Will definitely make again, easy to make. I liked the fact that the cake when baked was level when it came out of the oven. I recently made a cake that didn’t come out level. Does anyone know why this comes out level, is it the sifting, the way the buttermilk and dry ingredients are added? I personally attribute it to the lightness of the batter. I find the denser a batter, the more the cake will dome. I made these into cupcakes and substituted coconut oil for the vegetable oil and butter for the shortening. Also used just all purpose flour because my daughter is allergic to corn and there is corn starch in cake flour. Baked at 325 for about 18-20 min. These tasted wonderful and my guests loved them. Hello I’ve made this cake many times and it’s wonderful! I beat you the oil/shortening for about 17 minutes on med-high until it almost looks like whipped cream. Makes the cake super moist. 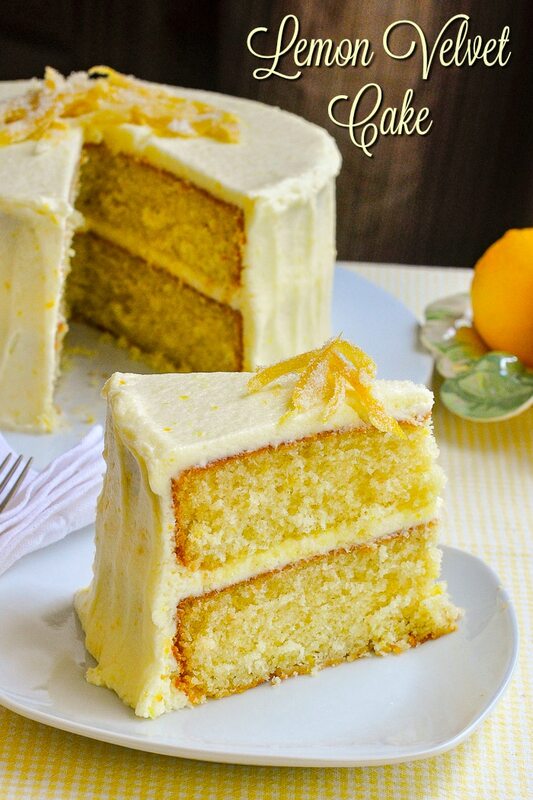 I would like to make an orange variation of this cake. How much orange zest should I use and do you think I’d be able to use some fresh OJ in place of some of the buttermilk or would it change the texture? Depends on the oranges but about the same as the lemon. I would not add a lot more juice/acidity than the lemon version. It may rise too quickly and then fall. Thank you. I will post my results. Excellent cake. This cake rose high and was very fluffy. I wish I could post my picture. Thank you. Hello. This recipes calls for lemon extract. Can I substitute it with lemon juice? and what ratio? I am counting my lucky stars for having come accross this page!! I just have a question. Have you tried to use it for multiple tiers? The cake is so soft that I worry it may fall apart if I try to stack it up. Also, if I omit the lemon extract and lemon zest, would that make it a decent vanilla cake? …It is so hard to find a good vanilla recipi. Hi Barry! I’m so thrilled I stumbled upon your site. I baked your white velvet cake two weeks ago and had the greatest success with that. Finally I had found a white cake recipe that was absolutely perfect. It was probably the longest search I’ve made for any proper recipe! Delicious. So when I saw your lemon velvet I headed straight to my kitchen with the highest hopes, and sure enough, another gorgeously moist and scrumptious result! I could not be happier! Bravo Barry!!! Thanks! Glad it was such a success. Hey Barry! Cake looks amazing. Quick question, all that’s available is the Butter vegetable flavoring shortening, think it will affect the flavor and/or texture of the cake? Never used it. The lemon should still be quite dominant though. Hello me again! If I wanted to use this for cupcakes, would I still bake at 325? Yes indeed. Let the toothpick test be your guide for when they are done. Man this recipe is awesome! Thank you for sharing! Hi can I replace shortening to butter for the cake ? You can but it will not be as tender a crumb to the cake. Hola, se puede cambiar el aceite por mantequilla y en que cantidad, soy de Venezuela y aqui usamos mas la mantequilla para hacer pasteles. Este pastel tiene una textura única que requiere aceite. I made this cake as a surprise for my husband’s birthday and he absolutely adored it! Thank you so much for sharing it Barry! Wow-this cake is amazing (and I’ve only tried the cake scraps so far!). 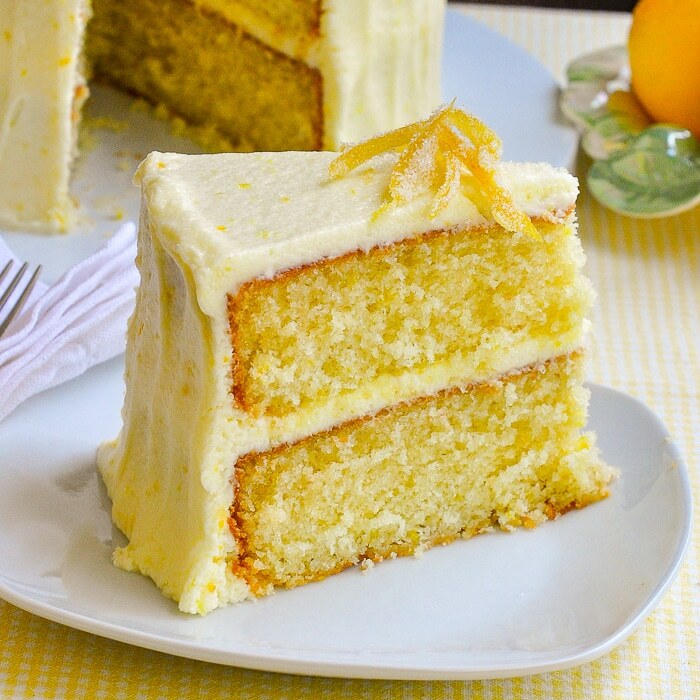 Light, moist, perfect balance of sweet to lemon. I frosted mine with vanilla Italian merengue buttercream, and filled with alternating rings of pomegranate raspberry jam and IMBC. I had to use a fan oven so dropped the temp to 140c and baked for 33mins in an 8″ tin (had to do the cakes one at a time and no issues w the batter sitting out). The flavors work so well together! Plus-It’s going to look so pretty when we cut into it. Thank you for a great recipe! Will try the other flavors soon I’m sure. Is there a coconut version yet? If not, do you think the white velvet w coconut extract would give it enough flavor? There is a coconut version if you search for it. Made this for a dinner party where we didn’t know anyone prior to going. So I wanted to be sure I took a very good cake to share. This was the perfect choice. The cake was moist and delicious. The frosting was outstanding. I added lemon juice in addition to the lemon extract and a little more zest. It was just enough frosting for two layers. I will never use a lemon cake mix again! Made this for my 86 & 85 year old in-laws and it was a total hit! Mother in-law said it was the best lemon cake she has ever eaten. I made this exactly as stated and the only difference I will make in the future is add a bit more lemon to the cake batter. Not that it wasn’t lemony, I just like a lot of lemon in my sweets. Recipe is definitely a keeper!! Have you ever done this as cupcakes. I need to do 50 lemon cupcakes and this recipe does look great. Yes, lots of folks make cupcakes. Love, Love, Love this light delicious cake! I’m so happy to find this recipe and it’ll be my go-to lemon cake from now on. I followed the recipe except that I added a little less sugar to the cake batter, freshly squeezed lemon juice, and extra lemon zest. For the frosting, I used one stick of salted and one stick of unsalted butter, 3 cups of sugar (instead of 4) and freshly squeezed lemon juice and zest instead of milk. It’s perfect – incredibly light, tangy, creamy, and sweet. My new favorite! Thank you so very much!! I like the light soft texture of this one best. Hi, I am curious for the people that substituted butter for the shortening, how did the cake turn out? I usually don’t comment on recipes, but I am just so impressed with how this cake came out, that I had to. I’m at 6,000 ft above sea level and cakes can be iffy, even with high altitude adjustments, but this is easily the best I’ve ever had, I decreased the sugar by about a tablespoon, the baking powder by a quarter teaspoon and increased the buttermilk and flour by 3 tablespoons to account for the high altitude and I ended up with the most perfect, moist and tender cake.. Thank you so much, you are a cake genius! I made this cake for my mother in laws 91st birthday on Saturday. I did add more lemon extract though to the cake batter. I also added some yellow food coloring to the batter. When I made the icing I didn’t like the taste at the time. I added the lemon extract to it and also squeezed some lemon juice in to it and some heavy whipping cream to thin it to a spreading consistency . Since the butter makes it a softer icing I wasn’t liking the flavor all that much but I put it in the cold car ( Indiana weather) and when I cut it at the restaurant it sliced beautifully and really tasted great. I wished I had taken another piece home with me instead of sending it all home with my in laws. I also used 8 inch cake pans. Made exactly as recipe stated turned out wo fearful, baked in a copper bakeware so needed no oil or flour on pan, when completely cooked it popped out beautifully. If you don’t have cake flour, can you replace it regular flour and what will be the measurement of the replacement? The cake flour ensures a soft texture. You can use the same amount of regular flour but don’t expect the perfect soft crumb that the recipe normally produces. You can make your own cake flour. Google it. It will change the texture of the cake. I ordered a slice of lemon cake at a local restaurant, and it was dry and tasteless. What a disappointment! To redeem that experience, I used this very recipe for the cake (I made a different cream cheese frosting). Yes, as promised, the cake was really tender. Thank you for helping me to make a cake that my dinner guests loved as much as I did.